We’re challenging Maryland’s thumbs-up for the renewal of the dam’s license. The Conowingo Dam is located on the lower Susquehanna River. On Friday, June 8, Earthjustice filed an administrative appeal with Maryland, urging the state’s Department of the Environment (MDE) to reconsider and revise its water quality certification for the enormous Conowingo Dam and Reservoir, a major hydroelectric operation owned and operated for profit by Exelon Generating Company. In order to obtain a renewed 50-year operating license from the Federal Energy Regulatory Commission, Exelon must obtain a water quality certification from Maryland, under a key provision in section 401 of the Clean Water Act. Here’s a summary of the issues we’re raising in partnership with our clients, Lower Susquehanna Riverkeeper and Waterkeepers Chesapeake. It’s critically important that MDE address these issues and fulfill its legal duty to protect the Chesapeake Bay for the human and wildlife communities that use and depend on it. The Conowingo Dam was constructed in 1928 and lies across the lower Susquehanna River. The Susquehanna River flows over 400 miles from New York to Maryland before reaching the dam. Millions of tons of sediment are deposited in the Conowingo Reservoir. 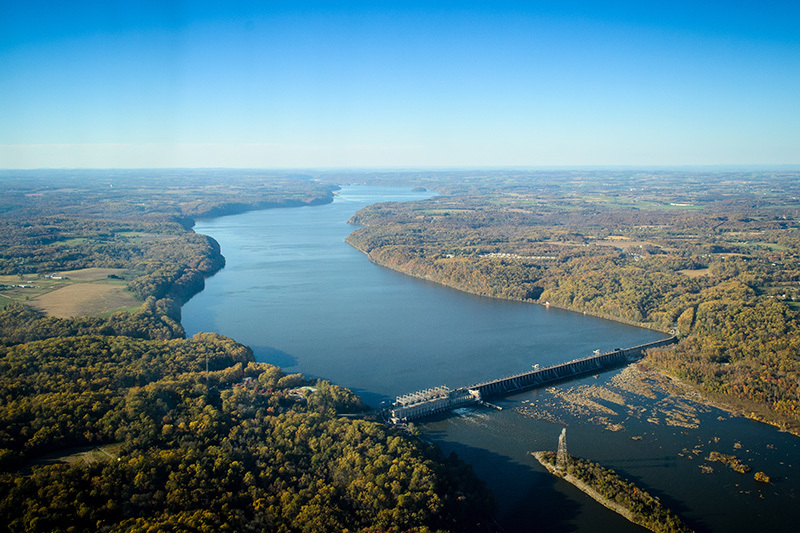 By the time the flow of the river reaches the dam, it has brought with it millions of tons of sediment, along with the nitrogen and phosphorous that are attached to the sediment, which ends up being deposited into the Conowingo Reservoir and trapped there. In 2014 Maryland and the Corps of Engineers announced that the reservoir is in a state of “dynamic equilibrium,” the point at which a reservoir reaches full capacity and the full volume of sediment and nutrients that are coming down the river will go through the dam and enter the bay. This will have a significant impact on the bay as it will lead to an increase in algae outbreaks and will harm the habitats of plants and fish. 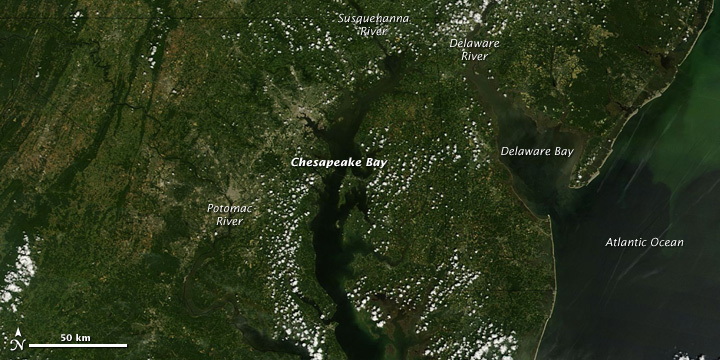 In addition to the concerns about the Conowingo Reservoir reaching storage capacity, during large storms and snow-melt events (those producing flows over 400 cubic feet per second) the trapped sediment will be scooped out and dumped into the northern Chesapeake Bay. Over the past century or so, the Northeast (including the Chesapeake Bay region) has experienced increases in the average annual temperature, amount of precipitation, and amount of extreme precipitation events, and these trends are expected to continue and strengthen in the coming years due to climate change. When a large storm occurs, a large load of the trapped sediment and nutrients that have accumulated in the reservoir will be discharged by Exelon’s operation. 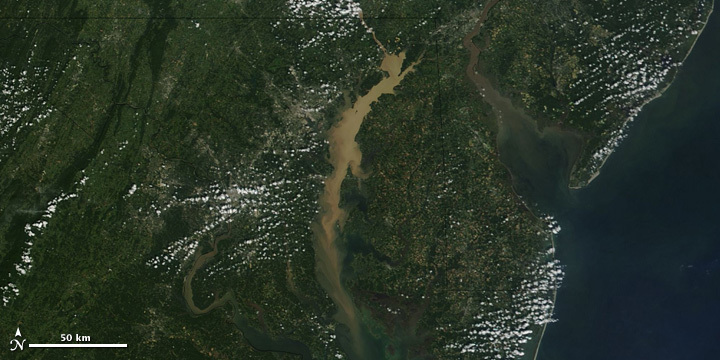 This dual-image comparison shows the thick sediment that clogged Chesapeake Bay in the aftermath of Tropical Storm Lee. The left image shows the bay in its normal condition on Aug. 23, 2011. The right image shows the mud and debris pouring into the bay several weeks later, on Sept. 13. This has happened before with dire consequences: In 1972, during Hurricane Agnes, and in 2011 during Tropical Storm Lee, so much sediment was discharged into the northern bay that it took years for the underwater plants, oysters, and other aquatic life to recover. This type of situation is virtually certain to happen again during the 50-year license period, and the results will be even worse since there is now more sediment than ever behind the dam. The Clean Water Act Section 401 certification process requires the state to consider whether any aspect of the project would violate relevant federal or state laws, such as those regarding water quality standards. Earthjustice, Lower Susquehanna Riverkeeper and Waterkeepers Chesapeake submitted comments to MDE requesting that the agency address the sediment issue by imposing certain conditions on Exelon as part of the certification process. Specifically, we asked that MDE either impose conditions requiring Exelon to participate as a financial partner in a specific plan for removing sediment from the Conowingo Reservoir or, alternatively, deny the application due to its deficiencies. Further, we asked that MDE include a detailed analysis of the effects of climate change in the Section 401 certification in order to accurately assess the impacts that the dam will have on the state’s water quality standards. On May 11, 2018, MDE issued Exelon its Section 401 water quality certification for the Conowingo Dam without addressing the significant concerns raised in our comments. The issuance of the Section 401 water quality certification allows Exelon to move forward with the renewal of its license — a license that will last for a term of 50 years — without any of the protections necessary to deal with the imminent sediment issues. MDE’s decision to grant Exelon’s application will undermine the state’s own water quality goals and pollution control measures that have been instrumental in improving the health of waterbodies in Maryland. Jennifer Chavez is a staff attorney. Her legal work focuses on protecting water resources nationwide and in the Chesapeake Bay region, and to end mountaintop removal mining in the Appalachian coalfields. Lisa Fuhrmann is a litigation assistant in the Washington, D.C., office.